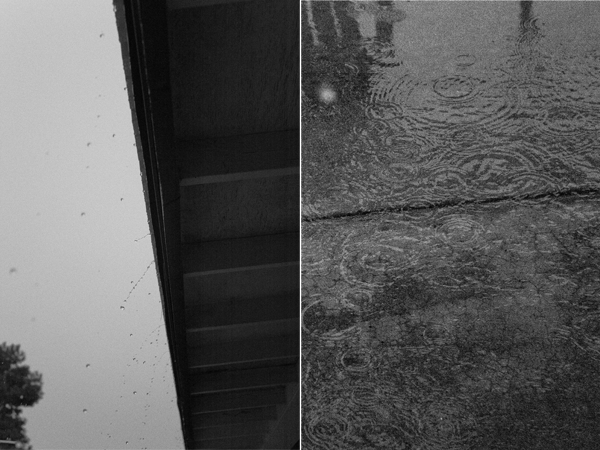 Is this the rainiest October on record? We had a gloomy, foggy summer that we kept thinking would clear and blast us with a heat wave. It didn't and we didn't order the roof. September and October are the locals' summer months in San Diego. These months are usually warm and sunny with big empty beaches free of tourists. But they weren't, they were misty and wet. So between a cloudy summer and rainy autumn here we are thankful for two alternating weekends of sunshine during which we roofed our little hearts out. Welcome back to our regularly scheduled programming. I'm not posting another thing about that four letter word that starts with an R until it's done, seamed up, and there's no more steel on my lawn. Did you know I have a vegetable garden? Yeah, I forgot. Totally. 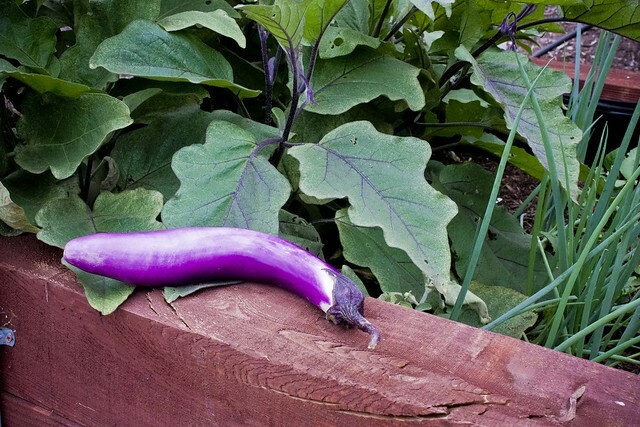 I happened to notice it today and found quite a surprise, this Chinese eggplant, a bunch of scallions and a hot pepper. Thanks garden for surviving without me. 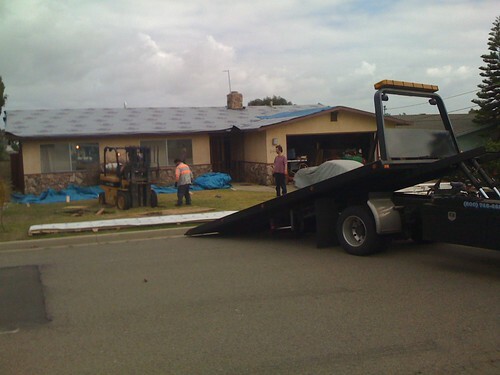 The roof arrived! 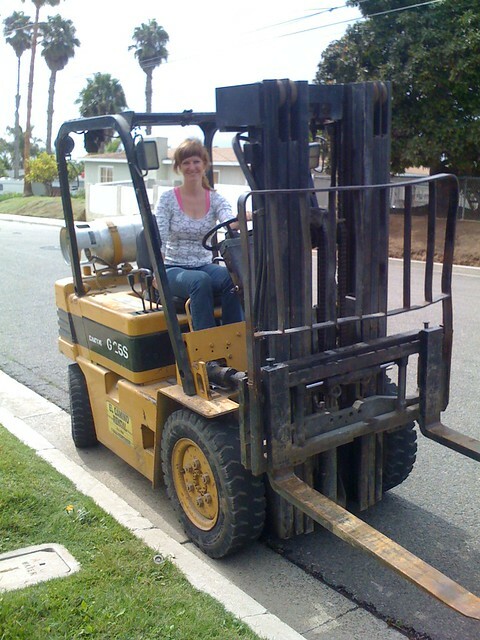 I learned how to drive a forklift and best of all the roof arrived! I may one day life in a home that doesn't rain on the inside. Wouldn't that be EXCITING? It's the little things in life, right? 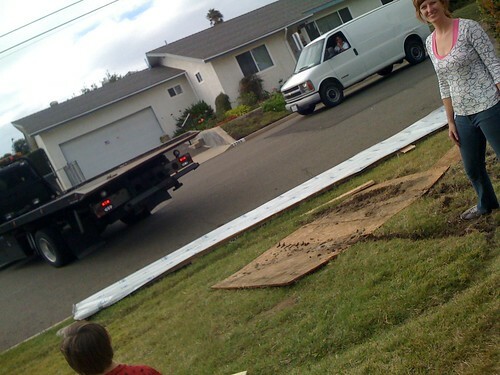 The big rig came with our sheets of steel. Zak did a great job of unloading our palettes safely onto the beautiful, green front lawn and driveway. 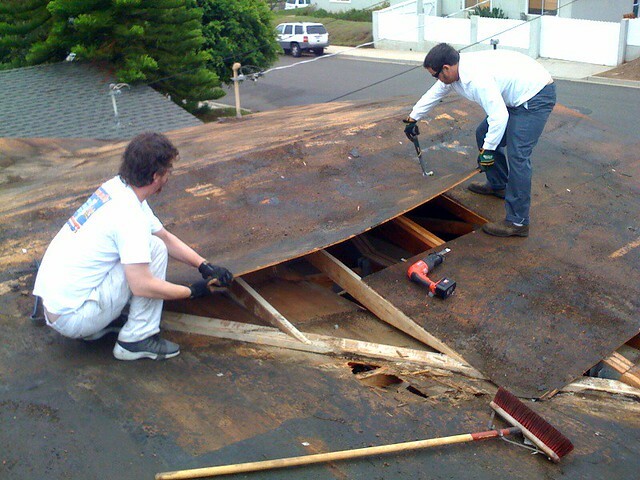 But having the roof on the edge of the property wasn't good enough for these men. 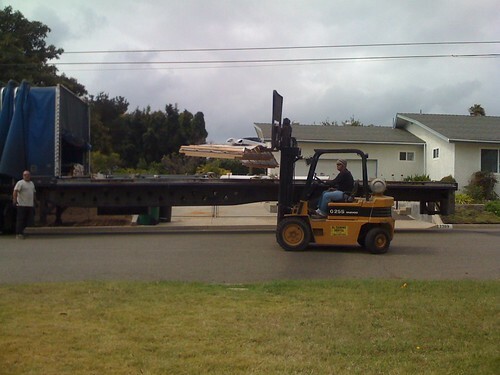 They decided to hop in the forklift and "just spin the palette around," put the metal "a little closer to the house." 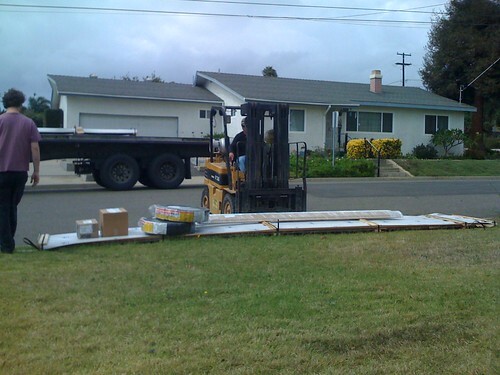 But what they managed to do was put the forklift a little closer to the water main. About a foot into my FRONT LAWN. Oh, how lovely. Maybe I could plant some pansies around it? And then I had the pleasure of meeting Joe and his giant tow truck. 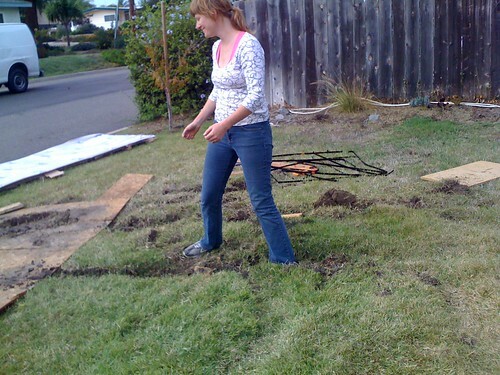 Joe saved my sanity, as you can see by the huge grin on my face while I'm standing in a GIANT HOLE on my FRONT LAWN. All I can do is hope my roof does not take the same path as my FRONT LAWN and drink gin. Lots of gin. 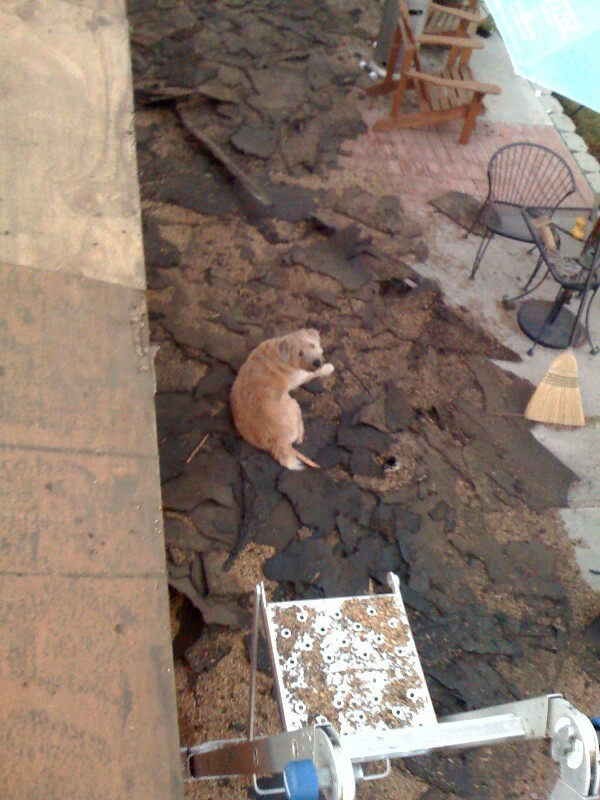 So I guess after the the roof is done we're going to redo the front yard? Who's got a sod cutter? Or maybe I should say who wants to rent another forklift and do doughnuts? Today was more scraping, cleaning and most of all repairing. 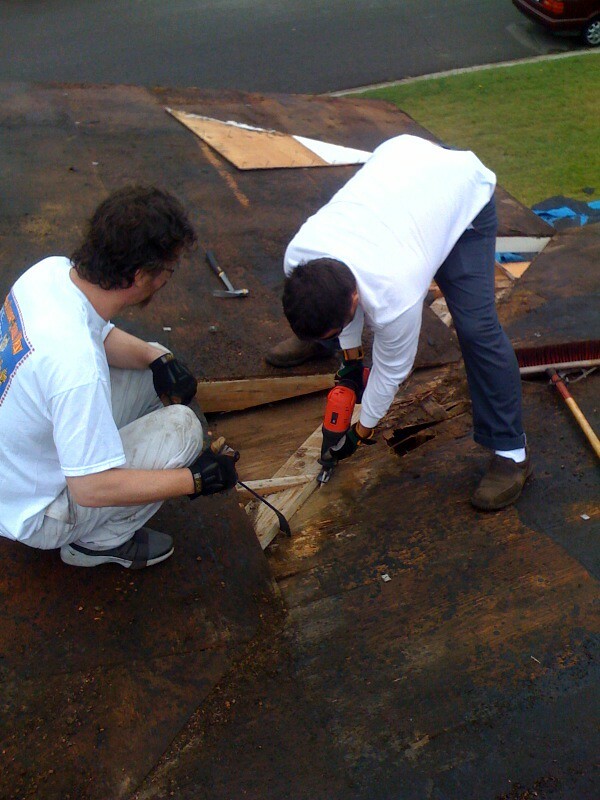 We spent a huge chunk of the day ripping up chunks of the roof. 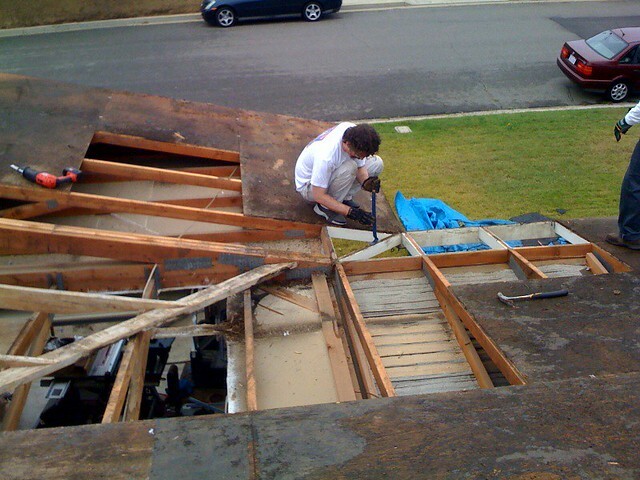 The valley over the garage was our main problem spot where we found our never to be forgotten problem spot, THE HOLE. 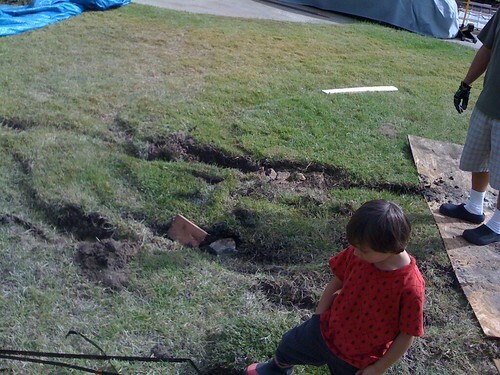 THE HOLE had to go, obviously, but it will never be forgotten. So we demoed around THE HOLE. But the rot needed to be cleared from the whole area. 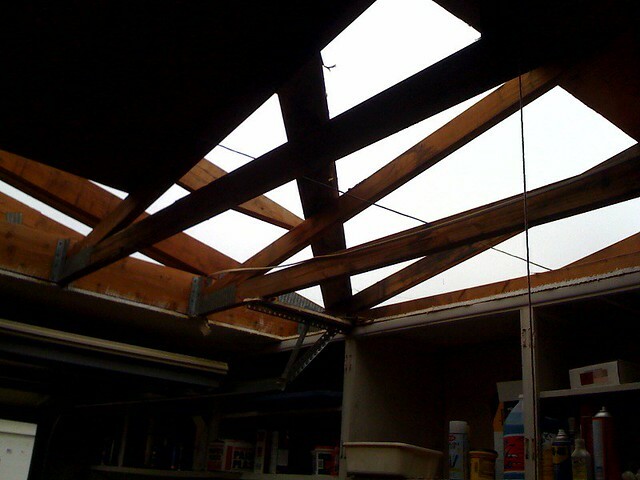 THE HOLE turned into a beautiful skylight for the garage, so architectural! I'm kind of amazed every time I look at those boards. I can't believe we really got it all patched up and it looks great! 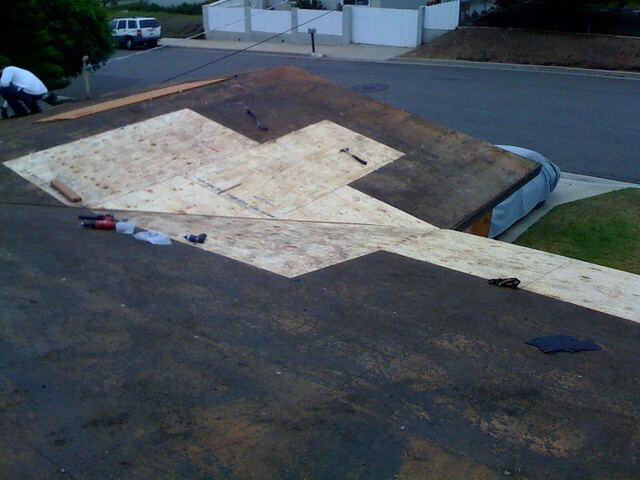 We also managed to clean the back of the roof and put down the underlayment. But I don't have a good photo of that because the guy were yelling at me to get back to work! More tomorrow, if I can move. Why would he wait for us anywhere else but at the base of the ladder? The reroof project has generated a bit more debris than we originally expected, nothing unmanageable but it's pretty dirty. 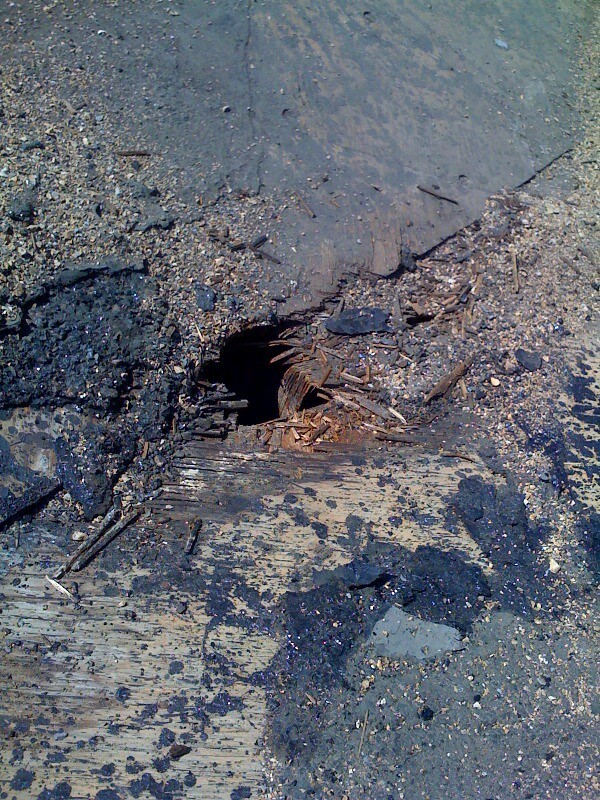 Today we will figure out how to get that cleared up along with repairing any rotten wood. I'm not quite sure how I'm going to lift sheets of plywood up a ladder but, hey we'll figure it out. Right?